I made Tom take him to the vet because I was a little sad about it all and I didn’t want Linus to think it was my idea. I remember back on the time when Sampson had surgeries where he wasn’t supposed to be active, I was dreading trying to do the same with Linus. Linus loves his walks, loves chasing the ball and loves playing with his good friend Stella. A week of trying to keep Linus calm and inactive may just put me over the edge with this big guy ~ so I thought. We knew one thing for sure going in, “the cone of shame” was going to be around his neck for a week and if nothing else we would find humor in the situation. Linus, our healer, has been a trooper this week. He’s been calm and seems to be ok with the fact that he needs some time to heal. 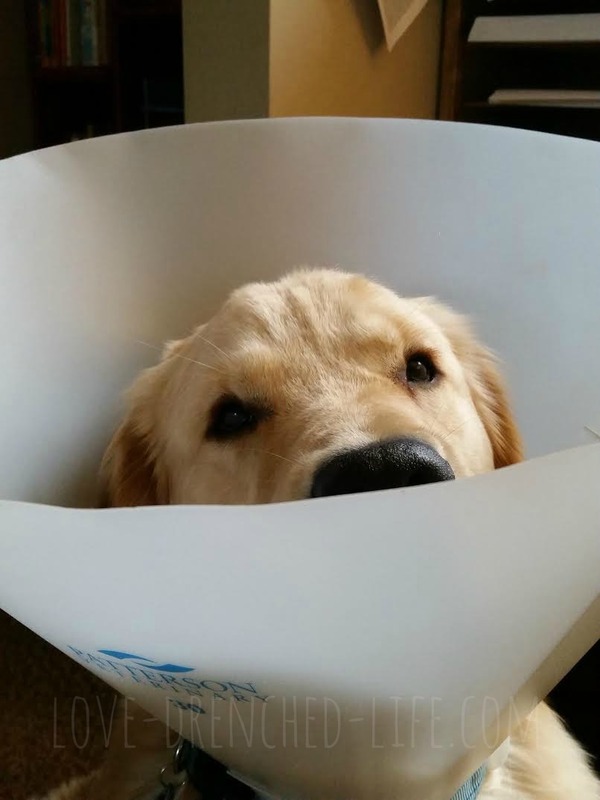 “The cone” doesn’t seem to bother him at all. He actually sits really nice when I put it on him, almost suggesting that he likes wearing it. 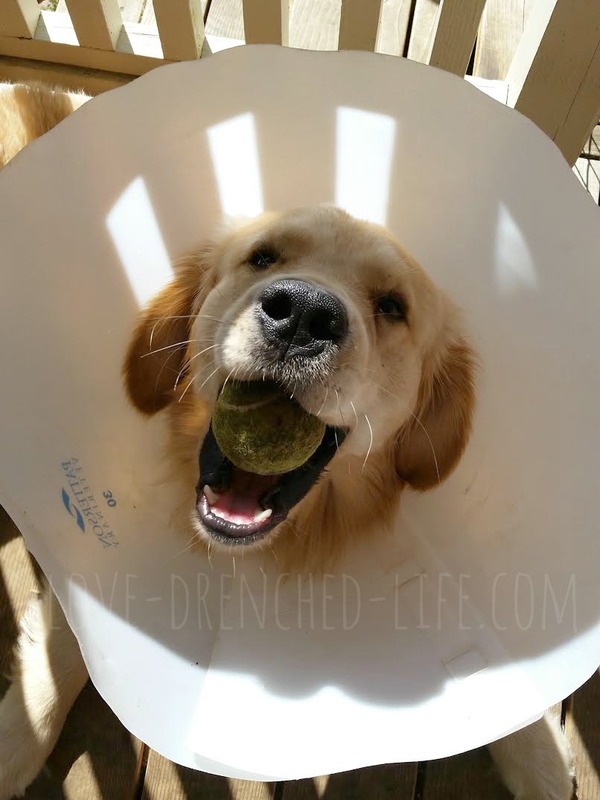 Yesterday I found him lying on the porch with a tennis ball in his mouth, I watched as he tossed it gently into the air catching it in the cone and then tilting his head around get it back in his mouth…this happened a handful of times and I have to say I was truly impressed by his antics. This morning he desperately wanted to go out back, he loves chasing the cat and exploring the back yard each morning to see if there is anything new and exciting to eat. This time I found him lying on the back porch with a cone full of dirt. I’m not sure what he was saving it for but I give him credit for being resourceful. This big yellow dog of mine sure does bring a smile to my face. 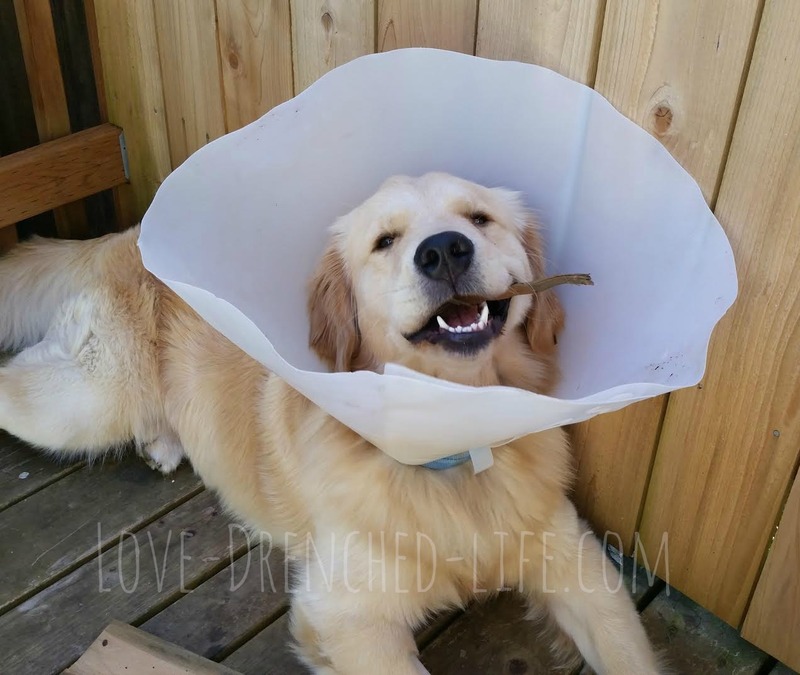 Cone or no cone I’m glad we are his people and he is our healer.